Excellent helmet . Recommended for people with larger head. Very noisy when closed. A lot of wind noise. I bought it however to use it in open position. Bought as an replacement for my old Nolan n90. Measurement was the same as my old helmet and also matched the fitting guide provided. A good snug feel with no roll or movement once on. Visibility is excellent and the noise levels are low compared to my previous one. Opening of vents and sun visor are really easy even with gloves on. Also bought the n-com system which can go with it. Easy to fit and use, so a perfect match. Would total recommend to anyone. Lovely Helmet! I've used this for about 600 miles now. I had a Shoei Raid II, this is very slighly quieter, although I wear ear plugs anyway. I bought it because it was a very good fit, so it's very comfy in a tight way (hamster cheeks!). It's my first flip up, so the extra weight was a surprise to begin with, but I'm not aware of it now. On the bike, it's very stable, more-so that my old lid, with very little lift at speed. Visor is nice and big and the internal visor is excellent in town with the main visor up. Ventilation feels a bit feeble. The chin vent doesn't seem to do much at all, the top vent is noticeable but I find it very hard to operate with winter gloves. However I suspect the ventilation is a little limited due to the very effective cushioning around the neck, This is also my first polycarbonate lid...it feels more bendy and softer than a fibre lid. Why only 4 stars? The sun-visor retraction button can be very hard to find sometimes (winter gloves) The sun-visor can fog a little at low speed, probably could use some kind of coating..but won't be an issue above 10'C Occasionally I get some weird reflections from the main visor. 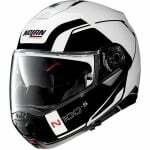 These really are minor niggles - if it fits you, and you want a really good helmet in the £300 price range - I'd highly recommend...and I love the metallic black and white paint scheme. SBS awesome as usual. Very nice, very comfortable. The best helmet I've had for vision, there is a bit of wind noise at 70 mph. The airflow is great and I am very impressed with it. This is my first flip front helmet, so possibly unfair to comment negatively about the design of the inner tinted visor mechanism. The slider to put it down is difficult to locate with a gloved hand when moving and the release button to send it back up is even trickier. I have no doubt that in time it will get easier, as my hand gets used to it's position. Also I think the sizing is a bit on the small side. I have been riding for 40+ years and I have always been a medium size (58/59), This is a medium (58/59) and is tight to put on and take off, but a lovely snug fit once on. Again this is something which will hopefully settle in time. I did read reviews before buying my new helmet, and many said how quiet they are. Ok, if you are riding around at speed up to say 40/50mph ish, then maybe. Ride at anything above 50mph or at motorway speeds and the wind noise is definitely there, and loud. I ride a Yamaha Tracer 900, and yes the fairing screen does create turbulence, and I will be fitting a different and hopefully better screen to reduce this effect, but this helmet isn't quiet. Also although there is plenty of room for my eye glasses, there is no dedicated slot in the lining so my glasses fall down and I am forever opening the visor to push them back up. I will either try and get my glasses adjusted or buy a new pair. The noise the visor makes on the ratchet is also loud, leaving ringing in my ears. I can't wear earplugs (for medical reasons) which is one of the reasons I bought the Nolan N100-5 after reading how quiet they are supposed to be. These moans are compared to the other helmets I have owned over the years. On the plus side, it is stylish and well built, all the latches are positive, and the positive clunk leaves you confident that the front is down. The colour really does match my bike. The intercom ready lining is a good thing, but I doubt I will ever use it. I have yet to try out the ventilation, but they work, though the top one is a bit stiff to operate, even without the helmet on my head. I have never previously bought a helmet online, and perhaps I shouldn't have done in this case as if I had tried the helmet on first, I would have probably gone for the next size up. That said, I can't fault the speedy delivery from Sportsbikeshop. I have no doubt that if I had asked to return it and buy the next size, they would have done without issue. This is an honest review, which will hopefully help future buyers in making a decision. Been riding bikes and scooters for 34 years and this is the best helmet I have used so far. Quality, fit & finish are great. Easy to install Nolan Intercom. 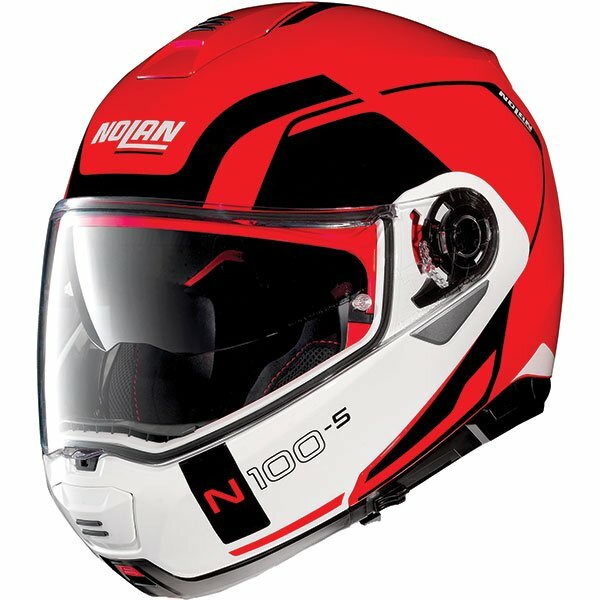 I purchased the first Nolan flip front, bust be 18 years or more ago and a great helmet. The new Nolan N100-5 is just fantastic, locks down and open's easy. The 5 position sun visor is great and can be used with the front opened. The fir for me is perfect, QD strap is a breeze to use. Finish is excellent with a great visor that comes with the "PinLock" fitted. The weight of the helmet is good and 50gr lighter than the early version, wind noise is very low indeed. To sum up a great purchase. Continuing on from the N104 Nolan have incorporated upgrades. Quality, fit & finish are superb & Pinlok is fitted to visor. 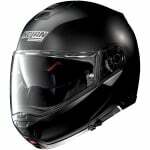 The first opening position of the visor is now much smaller which permits useful ventilation. The neck roll is adjustable for fit. The prone to leaking vents immediately above the visor have been removed. Chin & top vents have been increased in size. Only negative comment I have is that, as in my case, I was swopping over my Ncom5 from my N104, & found you need a keypad adaptor which is not provided with the helmet. Apparently if you buy an Ncom5 kit it is included. I could find no source of the adaptor in the UK & had to order from Germany. Should be included with the helmet. Quality engineered product adaptable for all types of motorcycle riding, not noisy and easily accessorised for intercom changes and input. Quality product. Wind noise is apparent. Opening front is excellent. I bought this to replace my Shark S900c which is full-face. I wanted a flip-front for border crossings and petrol stations etc but i don't care for riding with it up. Turns out this can be legally used up or down. Because i didn't care for flipped up riding, i didn't care for something like the Shark Evo One 2 - but i did try that on and I found it heavy and ugly. And plasticky. This Nolan helmet feels lighter than my old Shark and it has an enormous visor so vision is excellent - and with pinlock already attached (i love pinlocks - they just work). Wind noise... it's really no worse than my old Shark. In fact if anything it's better: the lining is better but there are obviously more "holes" in the shell for wind to make noise... my verdict is that it blocks out the lower frequencies better (these are the ones I find fatiguing) but that more whistling sound comes through. These are comfortable without ear plugs for circa 40 minute commutes at 70mph in bad weather. The ventilation seems good too. No complaints at all. Excellent, only way to describe it. Good fit, terrific quality. Quality construction, and I love it. This is my third flip front, and by far the best. I would highly recommend. Also the service from Sportsbikeshop was second to none! Back into biking after a long break. Very surprised as to how everything has moved on, choices, options, PRICES. All that said this helmet for me is a perfect fit with easily operated everything, the quick release strap SUPERB, all mechanisms Visor Flip Front and Sun Shield appears well made. Surprised how light it is, unable to quote on noise reduction as I have no recent comparisons. I couldn't get my head round the massive pricing difference between colours but other than that very impressed. Recommend. I have had a N104 for some time. I felt an update was needed. I haven't been disappointed! So much comfort and new innovations. I found the multi position of visor and sun shield a great improvement. Well done Nolan!! Much quieter than my previous Caberg Tourmax and just feels very solid. The mechanisms for both the flip front and the sun visor work well. I have managed to accidentally pop the top vent off by accident but I was relieved to find it just clicks back into place. The ventilation is effective and you can feel the air being drawn to the exhaust at the back. I have installed the Ncom b901 to this helmet which it is designed to receive. Just wish Sportsbikeshop stocked it! Overall really well put together product. It's quiet and the visor doesn't leak in the rain which is a bonus. This is the flip front helmet I was looking for. Fantastic quality helmet. Really comfortable to wear & quiet when closed. Easily takes my speakers & mike & comfy with excellent sound quality on the move. Only negative for me is the catch to open front is too small & fiddly having to squeeze 2 catches at same time. Excellent fast service from Sportsbikeshop as usual & good price. I expected a bit quieter, but not bad either. Nice and everything works perfectly. Value for money is very good. 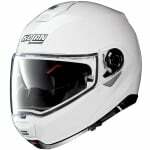 Great helmet, quiet, no wind noise, comfy, already installed Pinlcok works OK but on cold early mornings I had to open the visor a bit as Pinlock was getting a bit foggy but my main issue was the sunvisior has become faulty within the first month so disappointed. Thank you SBS.